I cannot help myself, I really do like Champagne. There is nothing more enjoyable than good sparkling wine in my opinion and there is no potentially finer sparkling wine than Champagne. What is more there is so much variety in Champagne, some houses produce a rich style, some a soft one, others a mellow one – surely there is something for everyone. Rather excitingly I have recently stumbled across a small Champagne house that I am convinced deserves far greater fame. Champagne Legras & Haas is a Champagne domaine founded as recently as 1991, but if the name rings any bells then you might well be thinking of Champagne R & L Legras which is a famous old Champagne house in the village of Chouilly in the Côte des Blancs. I have never tried their wines, but they have a very high reputation. Before he created his own estate in 1991, together with his wife Brigitte – whose maiden name was Haas, François Legras was the winemaker here as his forebears had been since the sixteenth century. Amongst other things it was his desire to be a true vigneron, a grower with a domaine that made him strike out on his own and today the house has 31 hectares mainly in the Grand Cru village of Chouilly, although the conditions of the region mean that they do still buy grapes in from trusted local growers – mainly for their standard Tradition Non Vintage (N.V.) Brut. 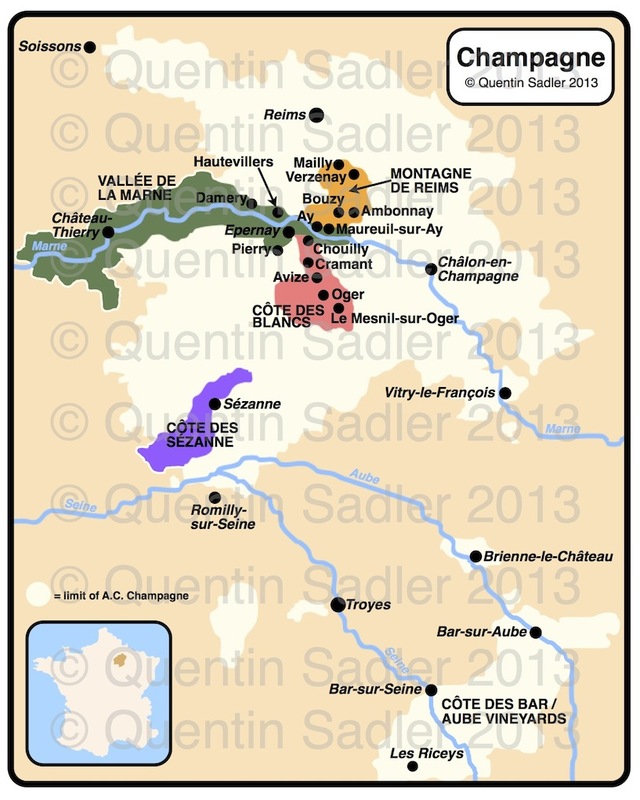 Their Pinot Noir is grown mainly in the slightly warmer Aube area to the south. Today the house is run by François’s sons Rémi and Olivier Legras and I think the wines they produce are remarkably fine. As they are based in Chouilly in the Côte des Blancs, with its chalky fossil rich soils, they concentrate on Blanc de Blancs style wines – that is Champagnes made solely from white grapes which by and large means Chardonnay in Champagne. Contrary to popular belief Pinot Blanc – Pinot Vrai locally – can be used in the region too, but it is very rare. Much of the soil in Chouilly is Kimmeridgian clay as in Chablis and this together with the cold climate and short growing season really does dominate the style of wines. Legras & Haas Blanc de Blancs Grand Cru Brut N.V. The nose was lovely, fresh is the main word I would use, but there were little touches of apricot, lemon zest, pastry crumbs and stone – this really did entice and hint rather than deliver fully formed characters. It is a tease of a wine, smelling this is like watching a burlesque act. The palate was clean and crisp with high acidity and lots of flavour of citrus fruit, green apples and minerality as well as some biscuit-like characters. The mousses was persistent and fine – and I am not one to comment on the fizz normally as it depends on too many other factors. At only 7 grams dosage this is a very dry Brut Champagne which allows the purity and minerality to dominate. All in all this wine really excited me – 91/100 points. Legras & Haas Blanc de Blancs Grand Cru Extra Brut N.V.
Good as that was though it was this wine that really caught my imagination. Extra Brut has a dosage of less than 5 grams per litre, so the wine is allowed to dominate the style. There is no softness here, no fat, just precision and austerity. This means that the Champagne has to be perfect first time – like a water colour. Do try these Champagnes if you can, they really are superb. I would enjoy the Brut on its own, but I think they would be particularly good with food – some fruits de mer perhaps, especially the Extra Brut. Legras & Haas Champagnes are available in the UK from the Alaistair Nugent, Handford Wines and Private Cellar. Legras & Haas Champagnes are available in the US from United Estates Imports and Exclusive Wine Imports.